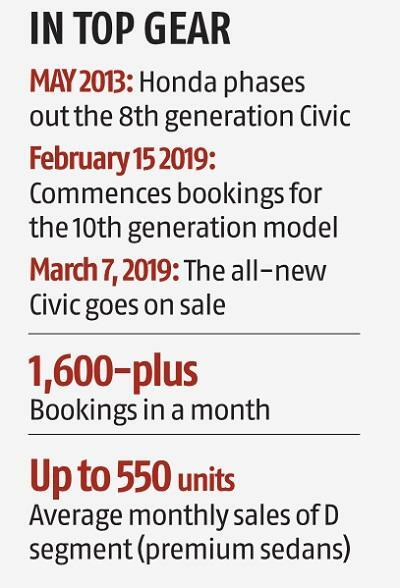 A month after Honda opened bookings for its 10th generation Civic, the local arm of the Japanese carmaker has managed to garner bookings for more than 1,600 units, three times the monthly sales in the segment, a top company official said. 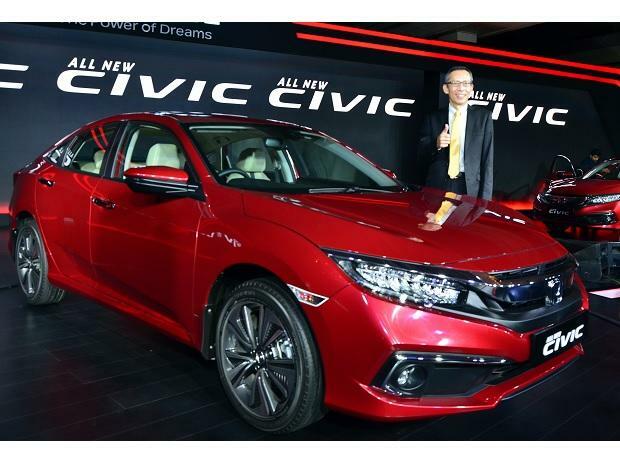 Honda launched the Civic on March 7 and accepted bookings for the model from February 15. The prices start from Rs 17.70 lakh to Rs 21 lakh (ex-showroom, petrol variant). “The respo­nse to the Civic has been phenomenal. The bookings that we have for the first month are more than three months’ sales of the segment,” said Rajesh Goel, senior vice-president and director for sales and marketing at Honda Cars India. He said there had been a lot of interest from cross section of customers, including existing owners, many of whom are celebrities and have held on to the older generation Civic and wanted to upgrade. Close to 85 per cent of the demand is for the petrol variant. Also, eight out of every 10 bookings received so far are for the top trim levels of petrol and diesel. The Civic competes with the Skoda Octavia, Toyota Corola Altis and Hyundai Elantra. With its large wheels and thickest tyres, it hopes to wean buyers off the SUV segment. It should be a good choice for those looking to upgrade from the lower D segment unless someone is absolutely keen on an SUV, said Goel. The upper D segment of the car market, as classified by the Society of Indian Automobile Manuf­acturers, comprises sedans and (4500 mm-4700 mm) with an engine size of up to two 2 litres. In the absence of launch of completely new models and buyer preference shifting to SUVs, the segment has lost its sheen. In the year that ended in March 2018, the segment sold a total of 10,350 units against 11,730 units a year ago, according to Siam. With many models being discontinued, the segment size has shrunk to 540 to 550 units a month. The Civic returns to India after a hiatus of six years. Faced with unfavourable exchange rates and capacity constraints, Honda pulled the plug on the Civic in 2013 and skipped the ninth generation for the Indian market. A strong shift in favour of diesel owing to the huge price gap between the petrol and diesel had caught Honda, which didn’t have a diesel engine option then, on the back foot and forced the company to phase out the model, said Goel. Diesel-powered cars accounted for two third of total sales then. With the 10th generation Civic, Goel expects Honda not only to rule the premium segment of the market but also revive the whole segment.